A few weeks ago, we finished assembling this control room in our plant for a client in the mining industry. The client needed a turnkey pre-assembled cabin and wanted it to be installed with one half outdoors and the other half indoors. Yet another particularity of this project was its interior soundproofed wall partition, which served as an acoustical barrier insulating both rooms from one another. Sometimes, my job makes me question the client’s initial design request and suggest improvements to better suit the company’s needs and constraints. By redesigning the HVAC system from the initial client design, we saved our client 25% of the total initial project costs. Here is an overview of some of this control room project’s features. There are important features when a control room is destined to be installed outdoors. Requirements to meet harsh weather conditions will impact HVAC, windows and doors as well as the roof and the structure. In this particular case the insulation needed to be adequate for harsh winter conditions, the windows had to have the thermal capacity to avoid freezing & condensation, doors had to resist to strong winds, the roof was installed with a two-ply membrane system to ensure it was weatherproof (rain, snow, freeze-thaw), and snow load weight had to be accounted for in the structure. In harsh applications such as the mining industry, durability is of the utmost important, and this is even truer when dealing with exterior installations. The cabins must be protected against UV rays to prevent the color from fading and cracking. Special attention must be taken in the choice of steel, paint coating, material and equipment in order to meet anti-corrosion and high temperature variations. Depending on the location and the industry, sometimes the control room resistance to specific chemicals, high humidity rates or saline environments must be taken into account in the choice of material. Taking these elements into account and choosing the right materials will help to bring the lifecycle of your control room to over 25 years maintenance free. When the control room is to be installed outside, it must be heated and cooled with HVAC units designed to be fully functional all year long, regardless of weather conditions (heating during winter and cooling during summer). The control room must also be held in positive pressure, which means the air flows out of the room instead of in. When opening the doors, the positive pressure prevents the outside dust, chemicals, snow, etc. from entering the building and consequently maintaining a safe and healthy work place. Silencers must also be used to avoid noise propagation in the air inlets and outlets. Not used to seeing silencers on the back of a control room? You’re right! 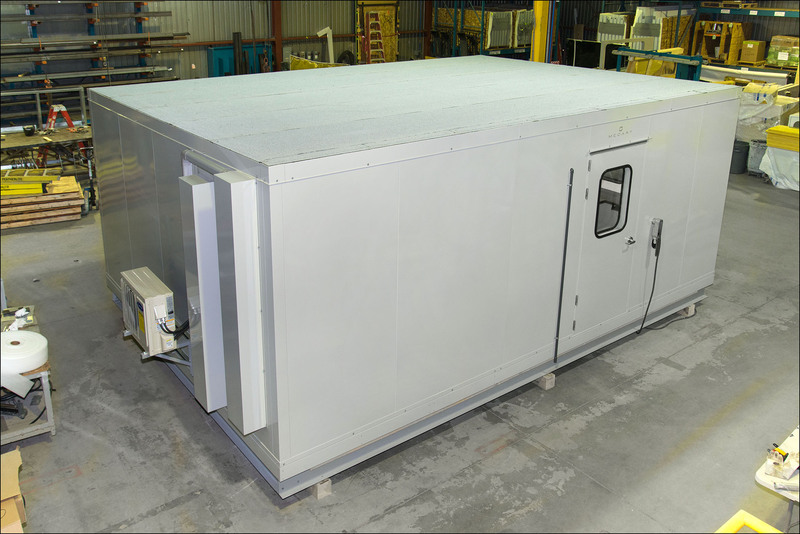 Silencers are typically installed on the sides or the roof, although as far as roofs go, weatherproofing for outdoor installations is necessary to ensure membrane remains free from potential penetrations; but in this particular case, size constraints forced us to install them at the back of the control room. Due to transportation restrictions, we could not install the silencers on the sides because the cabin was already 16 feet wide, the maximum width permitted for road travel. 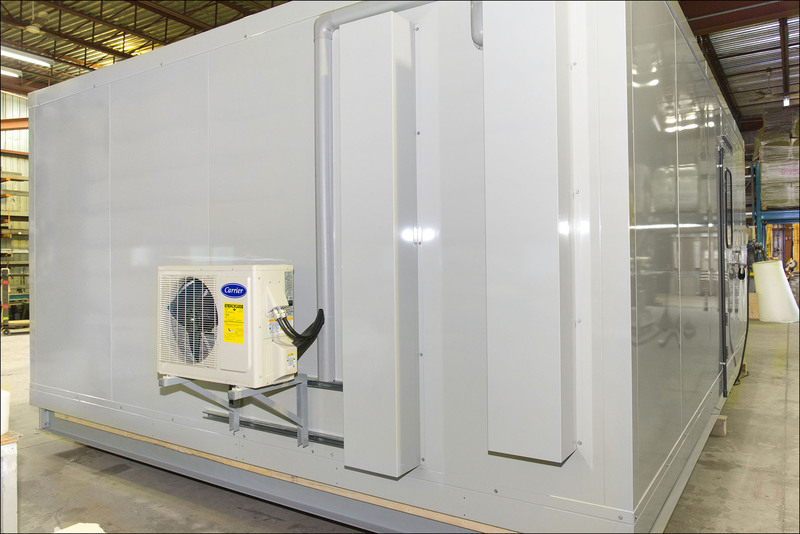 To remain soundproof, acoustical cabins need to be completely sealed-in, without any openings, but we still need a fresh air inlet and outlet to supply air to the personnel working inside. Silencers provide fresh air inlets and outlets without letting noise enter. Inside, the building was divided into two separate rooms, insulated acoustically from one another. The initial customer bid design included two roof-top HVAC systems, one for each of the rooms, adding unnecessary costs to the project. In order to save our client money, we wanted the control room to use only one ductless HVAC system (rather than two ducted HVACs) for both rooms. Since the air intake and outlet were at the back and to maintain the soundproof wall division, it proved quite challenging, but we succeeded in designing the control room accordingly, resulting in a 25% saving for the client on the overall project costs. Mecart accompanies the client from the initial assessment of needs up until the shipping and commissioning. We can even review and optimize the customer bid design for free, if need be, as it was the case in this project. 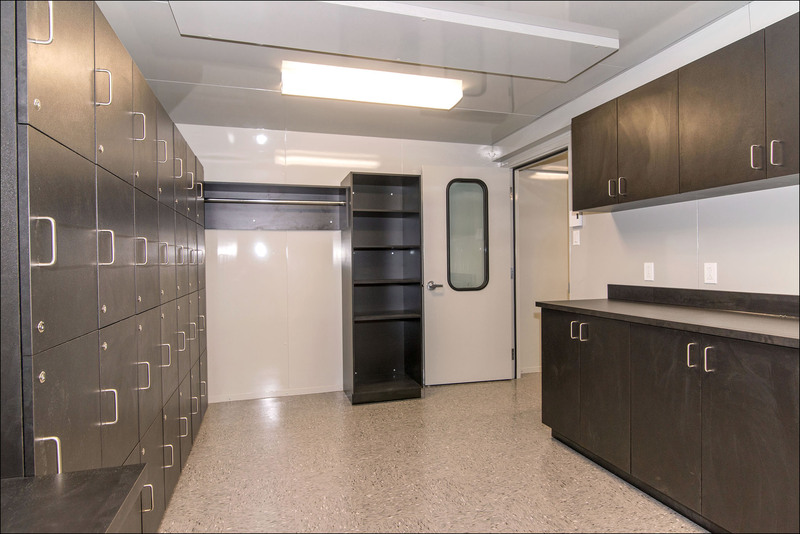 Finally, the client wanted a truly turnkey project, hence the control room was pre-assembled at our plant and we even supplied custom-made furniture.